With our cleaning services, we are committed to excellence with every job. Looking for professional cleaning services in the Apex, North Carolina area? At April’s Cleaning Services, we provide the crew managers, detailed checklists, and trained home-cleaning professionals; you determine the frequency of the visits and the amount of cleaning we do! With our cleaning services, we are committed to excellence with every job, whether it’s your condo, starter home, family-filled residence, or large estate. You can let our team take it from here! Move-in & Move-out Cleaning – We provide thorough cleaning and sanitation services to customers who are relocating to new homes or helping others in this process. This service for residents, landlords, and real estate agents can be used for houses being moved out of or into. Our move-in and move-out cleaning services are designed to alleviate some of the stress involved with moving. 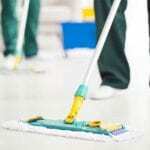 Reoccurring Cleaning Service – Scheduling a regular cleaning service will help you keep your home in great shape. Our team at April’s Cleaning Services will customize service to your needs and frequency. We can schedule our visits to fit your needs. To learn more about our cleaning services at April’s Cleaning Services, don’t hesitate to contact us to request a free estimate! Note: We have a full-service guarantee and want our customers to be 100% happy; however, we do not offer a money-back guarantee. Don’t have time to worry about your housekeeping to-do list in Apex, North Carolina? Turn to us at April’s Cleaning Services to enjoy a clean and healthy home! Schedule a free estimate today!